Fresno State Bulldogs wide receiver Keesean Johnson (3) is tackled after making a catch against the Boise State Broncos in the second quarter at Bulldog Stadium. Boise State football: Who’s coachin’ those Bulldogs? Fresno State has its own active leader in national stats, and he gets guidance from a name very familiar to Bronco Nation. That’s not to say Boise State doesn’t have its own stalwart as wide receivers coach. Eric Kiesau has molded his diverse group into one that has four different players with 30 or more receptions apiece this season. He steadfastly said during fall camp that this was going to be a strong unit. Now, can you believe it was just two years ago Kiesau was in the thankless position of guiding Fresno State through the final four games of a 1-11 season as interim head coach after the firing of Tim DeRuyter? Kiesau was offensive coordinator that year (during which Johnson made 66 catches). He knows a lot of the current Bulldogs and what they went through in 2016. These past two seasons have been a lot more fun for Kiesau. Rypien is going to have to be at his level-best if the Broncos are going to get the Milk Can back. In their only conference loss of the season against San Diego State, he was off-kilter, completing just 51 percent of his throws for 170 yards with two inteceptions. But in the Broncos’ only non-conference loss at Oklahoma State, Rypien threw for 380 yards and three touchdowns without a pick. Tomorrow night we might find out what kind of a chip-on-the-shoulder guy he is. The 16 semifinalists for the 2018 Davey O’Brien were announced yesterday. Fresno State quarterback Marcus McMaryion was on the list (as was Utah State’s Jordan Love). Rypien was not, even though his body of work stacks up well. Boise State offensive coordinator Zak Hill is a nominee for the 2018 Broyles Award that goes to the nation’s top assistant coach. Hill’s portfolio this year shows the Broncos ranked 20th in total offense at 468.7 yards gained per game and 21st in scoring offense with a 38-point average. And then there’s that third-down number, the second-best in the nation at 55.7 percent. With that said, if Hill’s offense can score 30 points on Fresno State tomorrow night, he should get the dang Broyles Award. No team has been able to do that since Washington put up 48 on the Bulldogs in September of last year. The Boise State recruiting class is starting to round into shape. The latest commit is defensive end Michael Callahan, who visited over the weekend and attended the thriller versus BYU. He gave his verbal last night. “The culture is what really stood out and why I'm so excited about being a Bronco,” Callahan told the 24/7 Sports. The 6-4, 250-pounder from Yorba Linda, CA, has 64 tackles this season, 11 of them tackles-for-loss. Among Callahan’s scholarship offers were four from other Mountain West schools, plus Harvard and Yale. Boise State now has nine commits for the 2019 class. San Diego State is one step closer to getting a new stadium on its terms, as San Diego voters approved Measure G Tuesday night to the tune of 55 percent, opening the door for the university to take over the Mission Valley site around the former Qualcomm Stadium. It’s called the “SDSU West” initiative. The competing group that formed a “Soccer City” project when it became clear the Chargers would leave San Diego claims that MLS Soccer will never come to town now. San Diego State says the 35,000-seat stadium they propose could indeed be designed to accommodate pro soccer. The big picture: a stadium that size would be such a better fit for the Aztecs and would give them a home field advantage they have not known. College of Idaho sports information director Mike Safford Jr. tweeted quite a nugget yesterday as the Coyotes’ final game of the season approaches Saturday at Montana State Northern. A six-game winning streak would have been unthinkable when the Yotes were 0-5 on the first of October. But it’s a very real possibility, as C of I is facing a 1-9 Northern Lights squad in Havre. Here’s what Safford pointed out: All 11 Yotes offensive starters are juniors or underclassmen, while nine of the 11 defensive starters are juniors or underclassmen. There are only two other seniors on the entire two-deep. “With a good recruiting class, the Yotes are set for a big 2019,” notEd Safford. The Boise State men’s basketball team is hard to scout going into Saturday night’s season opener against Idaho State. Coach Leon Rice emptied his bench in the exhibition win over Vanguard Monday night, and he didn’t play Patrick Dembley nor Justinian Jessup. Dembley was shelved as a consequence of his misdemeanor disturbing charge in June, just after he arrived in Boise. Dembley is a 6-0 guard and a reigning junior college All-American after averaging 19.9 points and four assists last season at Iowa Western Community College. There are lots of folks anxious to see him. Jessup, meanwhile, has been dealing with a sore knee. Final notes—the Boise State women officially open the season tonight against defending Big West champion Cal State Northridge in Taco Bell Arena. The defending Mountain West champs have a chance to take it up a notch this season with players like Jayde Christopher, the transfer from Kansas who had to sit out last season. Christopher dished out nine assists in Boise State’s exhibition win over Concordia last weekend. And the Idaho Steelheads scored two goals in the first 5½ minutes last night, spurring a 3-2 victory over the Tulsa Oilers in CenturyLink Arena. Newly-arrived goalie Collin Point, assigned to the Steelies by the Dallas Stars organization, made 28 saves in his Idaho debut. In a showdown for the Big Sky lead at sold-out Bronco Stadium, two of the greatest running backs in Big Sky history face off against each other: Boise State’s Cedric Minter and Nevada’s Frank Hawkins. 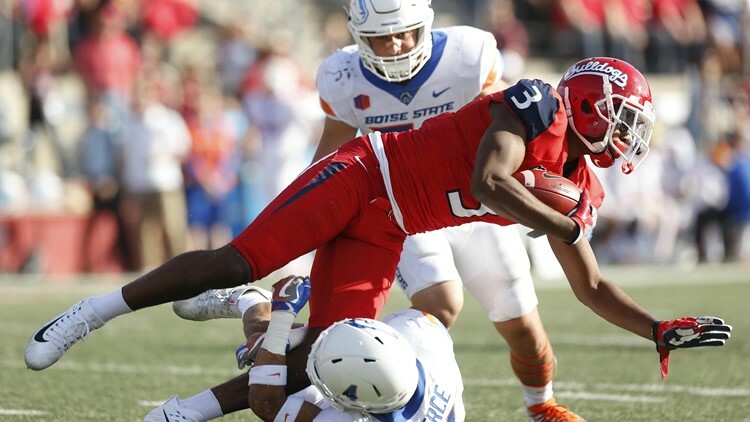 Hawkins carried the load for the Wolf Pack and had more yards, but Minter made the most of his carries—notching another 100-yard day and scoring what proved to be the winning touchdown in a 14-3 BSU victory. The Broncos would go on to win the Big Sky and the Division I-AA national championship.